Do you want to bring more joy and smile to your children? Our set includes a table and four chairs, which is the best gift for boys and girls aged 2-6. 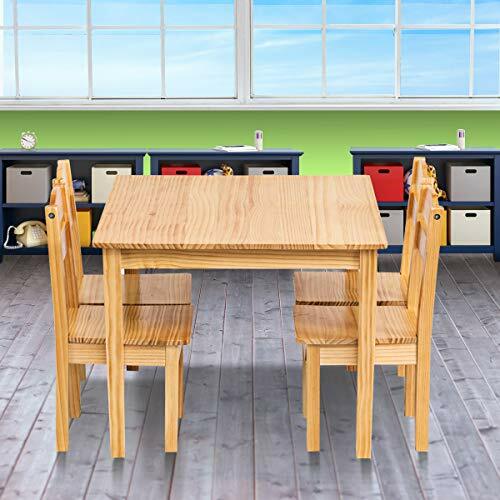 You can use it as astudy table, game table, dining table, activity table or picnic table to provide your children with perfect space to eat, read, draw, puzzle and playgames. 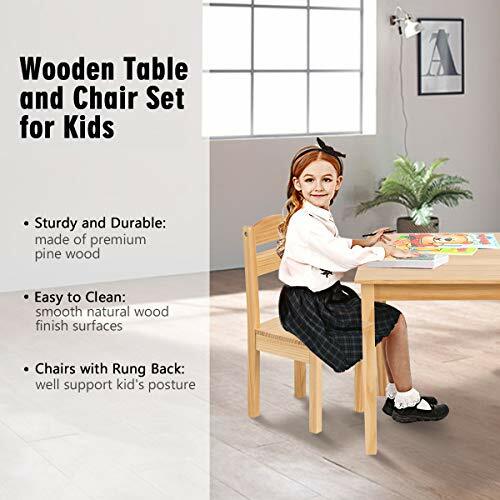 Made of sturdy pine wood and environmentallyfriendly paint, it is non-toxic and tasteless to ensure the safety of children.Smooth surfaces and rounded corners to avoid scratching your kid's clothes andskin. Let your children have their own space for imaginative and creative activities! Our set is your best choice, don't hesitate to buy it! The set includes a rectangular table and four chairs. It can be used as a picnic table, dining table,study table or game table for children. Designed for boys and girls ages 2-6, it is thebest gift for children. Modern and lovely design makes it suitable for anyroom in the home. Made of natural pine wood, the set is sturdy anddurable. The backrest of the chair makes your children sitmore comfortably. Smooth surface and rounded corners preventscratching and are easy to clean. Light weight allows children to move tables andchairs easily by themselves. Height from Seat to Ground: 11.0"